WARNING: For important information about avoiding distractions while on a call, see Important safety information. Add favorites. With Favorites, you can make a call with a single tap. To add someone to your Favorites list, tap . You can also add names to Favorites from Contacts. In Contacts, tap Add to Favorites at the bottom of a card, and tap the number to add. Delete a name or rearrange your Favorites list. Tap Edit. Return a recent call. Tap Recents, then tap the call. Tap to get more info about the call, or the caller. A red badge indicates the number of missed calls. Dial manually. Tap Keypad, enter the number, then tap Call. Paste a number to the keypad: Tap the screen above the keyboard, then tap Paste. Enter a soft (2-second) pause: Touch the “*” key until a comma appears. Enter a hard pause (to pause dialing until you tap the Dial button): Touch the “#” key until a semicolon appears. 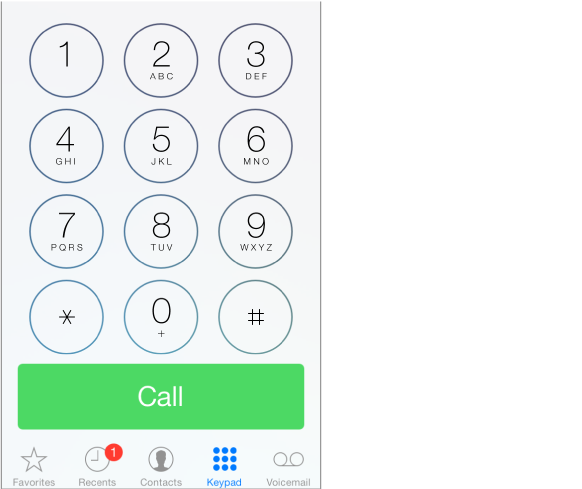 Redial the last number: Tap Keypad, tap Call to display the number, then tap Call again. Use Siri or Voice Control. Press and hold the Home button, say “call” or “dial,” then say the name or number. You can add “at home,” “work,” or “mobile.” See Make requests and Voice Control.